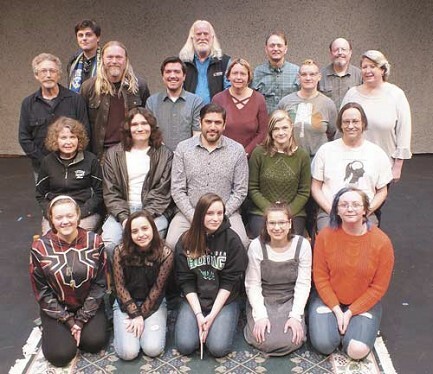 Cast members of the Nicolet Players production of �The Crucible� include, front row, left to right, Nicole Swanson, Liana Teter, Maya Paulson, all of Rhinelander; Malina Lazzeroni, Laona; Serra Laubert, Crandon; second row, Emily Bodensteiner, Nathan Roberts II, both of Rhinelander; Charles Lynch, Crandon; Anna Schwartz, Rhinelander; Cavan Kelly, Antigo; third row, Steve Richardson, Rhinelander; Bill Roff, Pelican Lake; KC Hofer, Crandon; Allison French, Nova Kane, Eileen Daniel, all of Rhinelander; back row, Max Shenandore, Dusty Sarazan, Tony Jones, and Al Higgins, all of Rhinelander. Jessica Roberts of Rhinelander will also be in the play but was unable to be in the photo. One of the largest casts ever for a Nicolet Players production will take to the Nicolet College Theatre stage in May to perform Arthur Miller's classic and powerful play "The Crucible." Twenty-one actors have been cast in the production which is set to debut in May. Arthur Miller wrote the Tony-award winning play in response to Sen. Joe McCarthy's hearings in the 1950s intended to expose subversive communists in the U.S. The playwright set his story in 1692, using the Salem Witch Trails as the backdrop. Performances are scheduled for 7:30 p.m., Friday and Saturday, May 3 and 4; Thursday through Saturday, May 9 to 11; and at 2 p.m. on Sundays, May 5 and 12. Tickets are $10 general public, $8 for students and seniors and can be ordered online at nicoletlive.com or by calling (715) 365-4646.